Introducing Teflon® Clear Coat Lenses! Now you can see clearer and crisper than with ordinary lenses. Ordinary lenses in eyeglasses cause reflections. These reflections create hazy, fuzzy, ghost images and halos that interfere with your vision. New Teflon® Clear Coat Lenses eliminate lens reflections so you can have clearer, crisper vision than is possible with ordinary lenses. Other benefits of Teflon® Clear Coat Lenses include built-in scratch resistance with an easy-care surface that makes dirt, fingerprints and smudges wipe away easily. 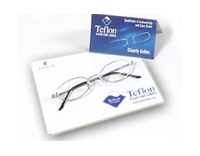 Plus, each pair of Authentic Teflon® Clear Coat Lenses comes with it's own certificate of authenticity and a complimentary lens cleaning cloth.